Understanding the social media demographics of each platform is an essential step to take before determining which platforms make the most sense for your brand to utilize. Each social media network comes in a different shape and size, with its own content strategy and user base, so there’s no one size fits all technique. You don’t want to waste your time creating content for a platform where your audience doesn’t actually have a large presence. Instead, you want to invest your valuable time promoting the platforms where your people live. If that’s on Instagram, you’ll want to spend time creating and curating graphics and images to share, and so on and so forth. Adapting your content strategy for each platform your audience uses is a great way to engage them. And step one is knowing what those platforms are. Data tells us age, gender, and location information for the people who tend to use each website and social media platform, but why not take this a step further? With Sprout Social, you can pull data from your specific social media platforms to find out the demographics of the actual people following you to make sure this is in line with your target audience. If you add Sprout Listening to your account, you can take this step even further. You have access to more than just the data of your followers. You can tap into the people who are talking about topics surrounding your brand. Find out how your audience feels about certain topics, what they’re talking about most, and how you can leverage that in both organic and paid strategies. Once you pull your own social media demographics, you can get started improving your overall social media strategy. Pair your brand’s data with insights from each platform and the Pew Research Center’s social media report to hone your audience segmentation with greater precision. Facebook still reigns supreme when it comes to social media. In fact, at 2.27 billion monthly active users, over a quarter of the entire world population is accessing their Facebook account at least once a month. Nearly 1.5 billion of those users are checking their accounts daily and 1.3 billion users are chatting with friends and family using Facebook Messenger. With 68% of adult social media users on Facebook, it’s a pretty sure bet you’ll find an audience on that platform. Let’s take a closer look at the demographics of their user base. 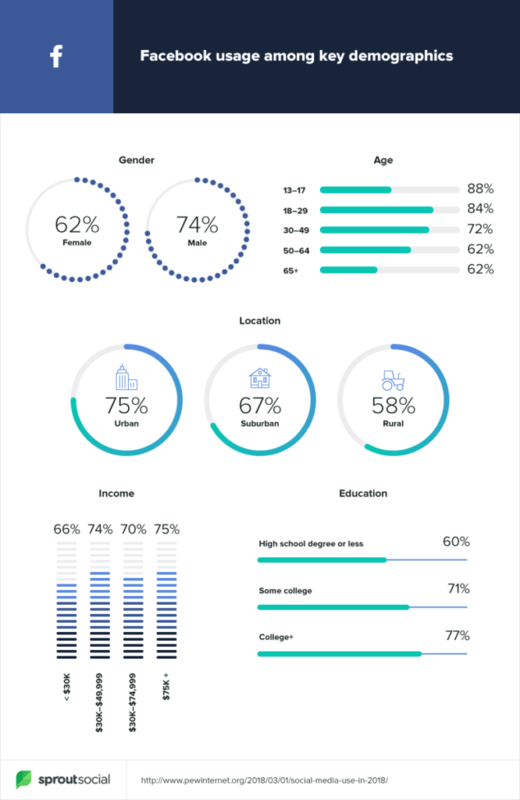 With the exception of adults aged 65 and older, Facebook is used by a majority of Americans amongst all other age ranges. 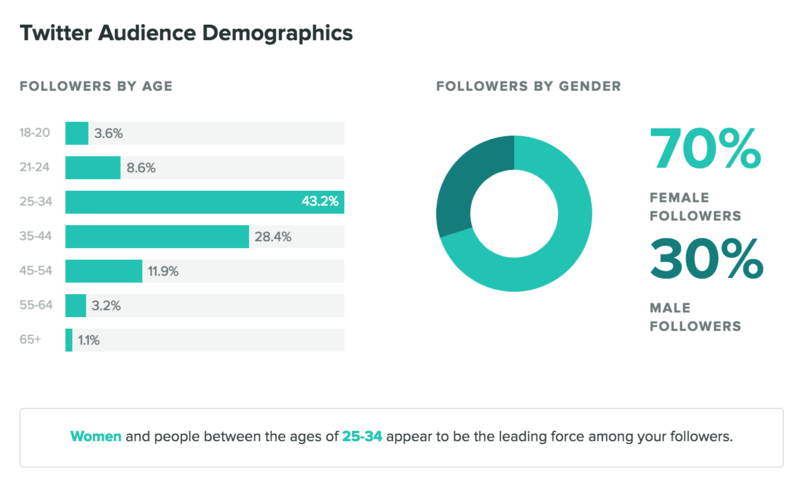 The platform is nearly split down the middle by gender, but leans more towards a female user base with 54% women and 46% men. Plus, according to the Pew Research Center’s report, 62% of all online men and 72% of all online women use Facebook, further speaking to its reach. 51% of 13-17 year olds use Facebook. 81% of 18-29 year olds use Facebook. 78% of 30-49 year olds use Facebook. 65% of 50-64 year olds use Facebook. 41% of 65+ year olds use Facebook. 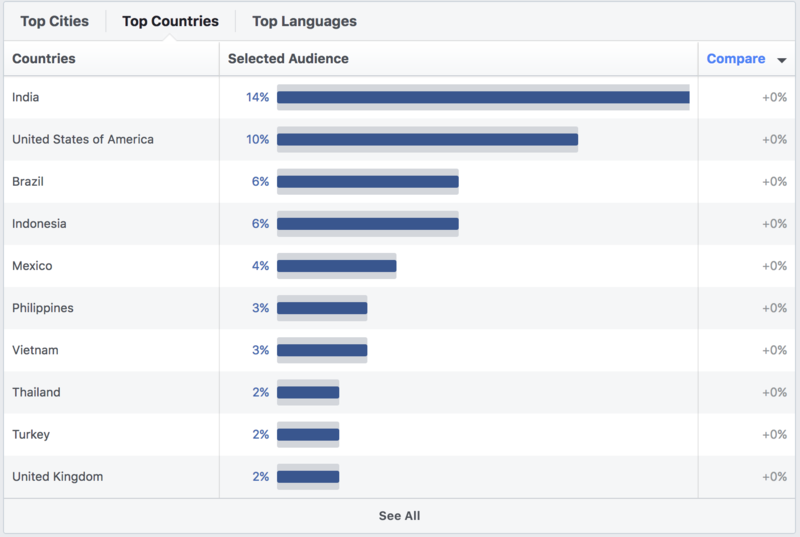 Facebook is used all around the world, with about 89% of monthly active users living outside of the US and Canada and more than 50% speaking a language other than English. With such a diverse platform, it’s easy to find a your target audience no matter where they are. The largest user base out of any given country is actually India, growing to 14% of all Facebook users this year. The United States is in second place at 10%, followed by Brazil and Indonesia at 6% each. 75% of adults living in urban areas use Facebook. 67% of adults living in suburban areas use Facebook. 58% of adults living in rural areas use Facebook. 60% of adults with a high school diploma or less use Facebook. 71% of adults with some college experience use Facebook. 77% of adults who graduated college use Facebook. 66% of adults who make less than $30,000 use Facebook. 74% of adults who make between $30,000–$49,999 use Facebook. 70% of adults who make between $50,000–$74,999 use Facebook. 75% of adults who make over $75,000 use Facebook. The Facebook-owned photo sharing app has grown in both features and its user base since its inception in 2010. Since the addition of Stories and IGTV in the last few years, its user base has only increased in size. Instagram is home to 35% of all US adults with 1 billion monthly active users and 500 million daily active users. Its Stories feature alone boasts 400 million daily active users. Instagram leans towards a much younger audience than that of Facebook, appealing to teens and young adults with its straightforward, photo-centric design and ease of use. 72% of 13-17 year olds use Instagram. 64% of 18-29 year olds use Instagram. 40% of 30-49 year olds use Instagram. 21% of 50-64 year olds use Instagram. 10% of 65+ year olds use Instagram. The photo-heavy platform is also more popular among women than men, with 39% of online women using Instagram vs. 30% of online men. Over 80% of Instagram’s user base resides outside of the US, with a few of the top countries including Brazil, India, and countries throughout Europe. 42% of adults living in urban areas use Instagram. 34% of adults living in suburban areas use Instagram. 25% of adults living in rural areas use Instagram. 29% of adults with a high school diploma or less use Instagram. 36% of adults with some college experience use Instagram. 42% of adults who graduated college use Instagram. 30% of adults who make less than $30,000 use Instagram. 42% of adults who make between $30,000–$49,999 use Instagram. 32% of adults who make between $50,000–$74,999 use Instagram. 42% of adults who make over $75,000 use Instagram. Twitter is incredibly popular among its user base, and it has also become an exceptional platform for brands to use for social customer service. As one of the last remaining social networks with a chronological feed, Twitter has stayed a favorite for many of its users. Most popular with people in their 20s, the micro-blogging platform caters to the younger demographic ranges. 32% of 13-17 year olds use Twitter. 40% of 18-29 year olds use Twitter. 27% of 30-49 year olds use Twitter. 19% of 50-64 year olds use Twitter. 8% of 65+ year olds use Twitter. The spread of women vs. men on the platform is nearly even. 24% of online women use Twitter. 23% of online men use Twitter. Over 79% of Twitter’s user base resides outside of the US. 29% of adults living in urban areas use Twitter. 23% of adults living in suburban areas use Twitter. 17% of adults living in rural areas use Twitter. 18% of adults with a high school diploma or less use Twitter. 25% of adults with some college experience use Twitter. 32% of adults who graduated college use Twitter. 20% of adults who make less than $30,000 use Twitter. 21% of adults who make between $30,000–$49,999 use Twitter. 26% of adults who make between $50,000–$74,999 use Twitter. 32% of adults who make over $75,000 use Twitter. LinkedIn is the number one platform when it comes to B2B social media marketing. Known for connecting professionals, LinkedIn has over 590 million registered users. 29% of 18-29 year olds use LinkedIn. 33% of 30-49 year olds use LinkedIn. 24% of 50-64 year olds use LinkedIn. 9% of 65+ year olds use LinkedIn. The percentage of online women and men on the social media platform is equal. 25% of online women use LinkedIn. 25% of online men use LinkedIn. Over 70% of LinkedIn members reside outside of the US. 30% of adults living in urban areas use LinkedIn. 27% of adults living in suburban areas use LinkedIn. 13% of adults living in rural areas use LinkedIn. Considering LinkedIn is catered towards networking for professionals and business owners, it’s no surprise that the majority of its users have graduated from college. 9% of adults with a high school diploma or less use LinkedIn. 22% of adults with some college experience use LinkedIn. 50% of adults who graduated college use LinkedIn. 13% of adults who make less than $30,000 use LinkedIn. 20% of adults who make between $30,000–$49,999 use LinkedIn. 24% of adults who make between $50,000–$74,999 use LinkedIn. 45% of adults who make over $75,000 use LinkedIn. Pinterest is a visual search engine that has revolutionized online shopping on their platform. With 250 million monthly active users and over 175 billion items pinned, it’s created an entirely new way to shop for products. In fact, 61% of pinners have made a purchase after seeing a product on Pinterest. Although more popular with younger users, Pinterest still has a steady user base across demographics ranges. 34% of 18-29 year olds use Pinterest. 34% of 30-49 year olds use Pinterest. 26% of 50-64 year olds use Pinterest. Although a higher percentage of online women use the platform, 50% of all new signups are men. 41% of online women use Pinterest. 16% of online men use Pinterest. More than 50% of Pinterest users live outside of the US. 29% of adults living in urban areas use Pinterest. 31% of adults living in suburban areas use Pinterest. 28% of adults living in rural areas use Pinterest. 18% of adults with a high school diploma or less use Pinterest. 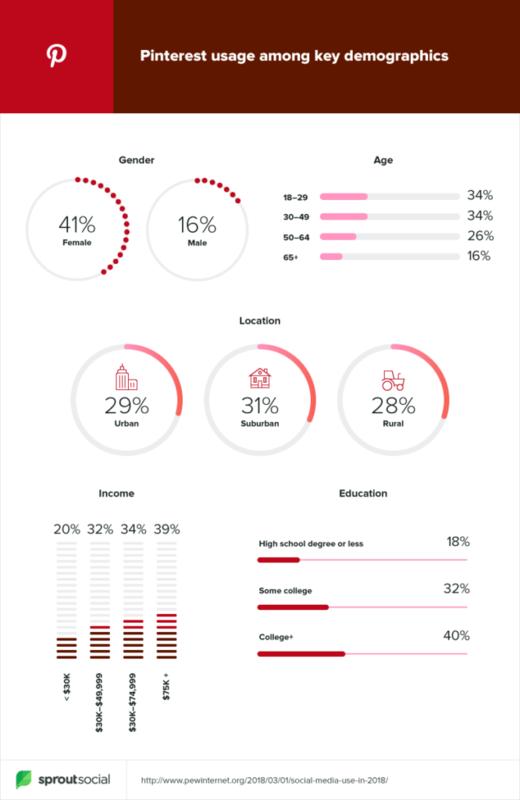 32% of adults with some college experience use Pinterest. 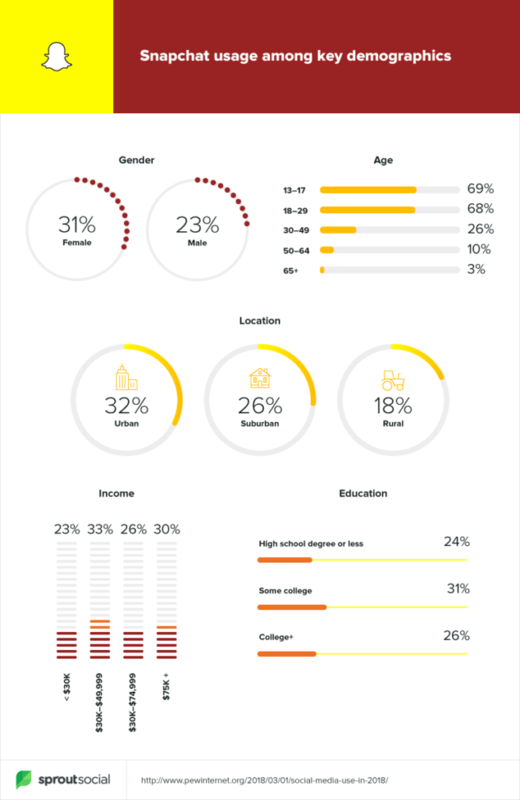 40% of adults who graduated college use Pinterest. 20% of adults who make less than $30,000 use Pinterest. 32% of adults who make between $30,000–$49,999 use Pinterest. 34% of adults who make between $50,000–$74,999 use Pinterest. 39% of adults who make over $75,000 use Pinterest. Snapchat came along as a disappearing messaging app and has quickly turned into a common way for teens and young adults to chat with each other on their smartphones. Although it’s been recently outshined by Instagram Stories, another version of disappearing updates and messages, Snapchat still has 186 million daily active users. Snapchat’s strength is in its appeal to younger audiences, and many of its users visit the platform multiple times a day. 69% of 13-17 year olds use Snapchat. 68% of 18-29 year olds use Snapchat. 26% of 30-49 year olds use Snapchat. 10% of 50-64 year olds use Snapchat. 3% of 65+ year olds use Snapchat. More women than men use the messaging platform. 31% of online women use Snapchat. 23% of online men use Snapchat. 32% of adults living in urban areas use Snapchat. 26% of adults living in suburban areas use Snapchat. 18% of adults living in rural areas use Snapchat. 24% of adults with a high school diploma or less use Snapchat. 31% of adults with some college experience use Snapchat. 26% of adults who graduated college use Snapchat. 23% of adults who make less than $30,000 use Snapchat. 33% of adults who make between $30,000–$49,999 use Snapchat. 26% of adults who make between $50,000–$74,999 use Snapchat. 30% of adults who make over $75,000 use Snapchat. Now that we’ve taken a look at the six most popular social media platforms and their demographics, let’s take a look at all social media demographics as a whole. 68% of adults use Facebook. 35% of adults use Instagram. 24% of adults use Twitter. 25% of adults use LinkedIn. 29% of adults use Pinterest. 27% of adults use Snapchat. With Facebook’s user base comprising nearly double the second most popular social media network’s user base, it’s no surprise that it’s still king in the social media world. However, digging into the detailed demographics above can help you better target your specific personas and audience niche. When working on your social media strategy, be sure to take these social media demographics into account so that you can find and target your audience online. combine this data with a tool like Sprout Social and you can track your strategy’s success with precision. How have you used social media demographics to inform your strategy? Let us know in the comments! Chloe West: Chloe is a digital marketing manager and freelance writer, focusing on topics surrounding social media and digital marketing. She's based in Charleston, SC, and when she's not working you'll find her at brunch or hanging out with her son. Follow her on Twitter @ChloeWest28.